Need individualized attention? Special allergy requirements? Mici cooks in your home and fills the fridge. ​The meals are designed to be enough servings for 4 people (generous portions). 2 meals per visit: as low as $229 2 meals usually lasts one person the whole week. **There are discounts for those that sign a contract for 3 or more months. This service does not include the cost of groceries or mileage. where you CANNOT account for cleanliness or culinary protocol. Before we begin, it's important that I learn your general likes, dislikes and allergies, if any. I cannot start cooking without this questionnaire. It protects you, helps me to keep all my clients straight and ensures I make a delicious meal with the right parameters for you. Mici truly cooks from the heart and her food was inspiring, beautiful and delicious! She is extremely knowledgable about her food and imparts that wisdom whike also demonstrating how to cook fresh, clean and tasty dishes!!! Can't wait to have her cook for us again! Would you like to learn how I made that pie or casserole dish last week? Just want to know how to cook healthier for you, your family and Mother Earth? 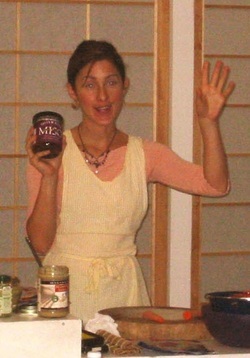 Are you on a healing Macrobiotic, Paleo or other regimen that you just can't understand how to do? Don't know what products to choose in a health food store? Cleaning, organizing, and setting up a kitchen are also available. Mici was given the gift of placement and natural desire to create order and cleanliness. Organization of kitchens, closets, garages, offices... Her focus is to provide efficient organization, creative room placement, and overall relaxation through order and cleanliness. Prices are given in estimates for each project. ​Usually $30/hour plus $.55/mile for any associated errands. Mici is trained in several healing modalities that help release attachments and let go of feelings that can lead us to unhelpful beliefs or behaviors. In a gentile process she can guide you to break mental association to addictive food patterns that sabotage your health. She also has many homeopathic allergy vials that she can apply to meridian points to aide in the reorganization of chaotic meridian flow, which some believe contributes to the symptoms of allergies.